WASHINGTON, DC, February 1, 2012 (ENS) – On Monday, Congressional Republicans tried again to force approval of the TransCanada Keystone XL pipeline. The proposed 1,700-mile-long pipeline would carry heavy crude oil from the tar sands of northern Alberta to refineries on the U.S. Gulf Coast. 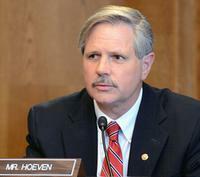 Senator John Hoeven, a North Dakota Republican, along with 44 co-sponsors, introduced a bill, S 2041, that would grant Congress the authority to approve the pipeline under the Commerce Clause of the U.S. Constitution. Hoeven, a former North Dakota governor, says that as part of the 830,000 barrels of oil per day the pipeline would carry to U.S. refineries, 100,000 barrels a day would come from the Bakken region of North Dakota and Montana. Hoeven says he obtained an opinion from the Congressional Research Service confirming Congress’s constitutional authority to approve the project. But this opinion contradicts the determination by the U.S. State Department and the Obama administration that because the pipeline would cross an international border, approval would require a Presidential Permit stating that the pipeline is in the national interest. On January 18, the State Department recommended to President Obama that the presidential permit for the proposed Keystone XL pipeline be denied and that at this time the TransCanada Keystone XL pipeline be determined to not serve the national interest. The President agreed with the State Department’s recommendation. This recommendation was based on the fact that the Temporary Payroll Tax Cut Continuation Act that was passed by Congress in December 2011 provides only 60 days for the President to make a decision on whether the pipeline is in the national interest. The 60-day provision was authored by Senator Hoeven and Republican Senators Richard Luger of Indiana and David Vitter of Florida, who are co-sponsoring S. 2041. An alternate route has yet to be identified. Senate Republicans say the administration has had plenty of time to review Transcanada’s pipeline application. But Congressional and public criticism of the State Department’s environmental assessment of the pipeline has prompted the department’s Office of Inspector General to conduct a Special Review. In a letter released November 7, 2011, a spokesman for Deputy Inspector General Howard Geisel said the IG’s Office will examine the State Department’s handling of its Environmental Impact Statement and its process for deciding whether or not the $7 billion pipeline would be in the national interest. The review comes in response to an October 26, 2011 letter of request for an inquiry from Senator Bernie Sanders, a Vermont Independent, and 14 other members of Congress, all Democrats. The Special Review will examine the State Department’s relationship with Cardno Entrix, a Houston-based environmental consulting firm contracted by the State Department to assist in preparing the EIS. 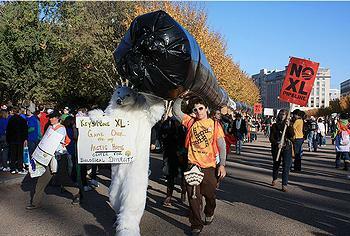 Environmentalists list a host of reasons why the Keystone XL pipeline would not be in the national interest. Environmentalists warn that extraction and refinement of tar sands oil produces two to three times more greenhouse gases per barrel than conventional oil. Extracting oil from Alberta’s tar sands is destroying tens of thousands of acres of boreal forest and polluting hundreds of millions of gallons of water from the Athabasca River, in the process creating toxic ponds so large they can be seen from space. “His decision represents a triumph of truth over Big Oil’s bullying tactics and its disinformation campaign with wildly exaggerated jobs claims,” she said. 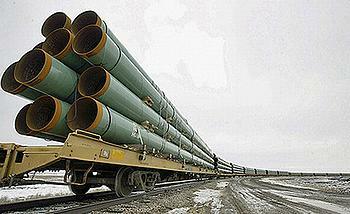 TransCanada has indicated its intention to reapply for a Presidential Permit for Keystone XL. Construction of the pipeline is supported by the American Petroleum Institute, the Association of Oil Pipe Lines, the Consumer Energy Alliance, the Independent Petroleum Association of America, the Industrial Energy Consumers of America, and the National Petrochemical and Refiners Association.